Make cooking for your backyard barbecues and Sunday morning breakfasts more fun and easy!Now you can flip pancakes, hamburgers, eggs and all types of foods without any effort at all. 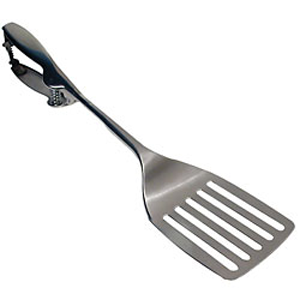 With the EZ Flip Spatula, you simply squeeze the handle and presto – your food is flipped! Made of heavy duty metal. Dishwasher safe.